Stunningly beautiful, quality fresh flowers with a special personal service. 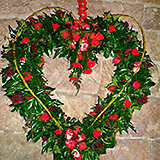 Bouquets, Weddings, Funerals, Christmas Wreaths, Valentines, Mother’s Day, Corporate – for all of your floristry requirements. 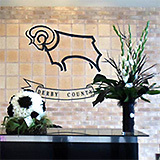 Wedding Flowers, Funeral Flowers, Flowers for Special Occasions & Creative Floral Designs, Derbyshire. 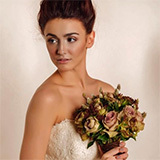 Beautiful wedding flowers, funeral flowers and flowers for special occasions delivered to Milford, Belper, Derby, Duffield and across Derbyshire, welcome to Riverbank Floristry. If you appreciate quality and creativity, you will be delighted with my unique and exciting floral designs. Whatever your occasion, I always use flowers of the highest quality. Every design is a work of art that will exceed your expectations. Wedding Flowers to Take Your Breath Away. Let your ideas come to life with arrangements that compliment your style, your personality and your vision. Call me now and tell me your plans, I’d love to hear them! All budgets catered for. Let’s turn your dream wedding flowers into reality, read more. Flowers say the words that are hard to speak. From traditional roses to arrangements that use colour and flowers of special meaning, you have the perfect way to say what’s in your heart. For more information or to discuss your ideas, contact me today. 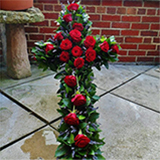 I deliver funeral flowers on the day of the service and work closely with you and the undertakers to make sure everything goes as smoothly as possible. Designed using your preferred flowers, colours and budget, my aim as always is to create stunning floral arrangements that express your wishes. All flowers are fresh and made with lots of love and care, read more. I lovingly create unique and beautiful designs for my clients, they are all individual and range from the seriously whacky to the traditional and formal, read more. 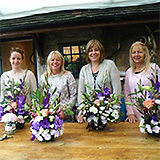 A professional, efficient service providing long-lasting floral designs for offices, events or as gifts to your clients. 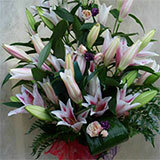 Strengthen your image with striking flowers, ordered specifically for your business. Please contact me today for a no obligation consultation, read more. Develop your creative potential with practical and imaginative designs. You’ll develop your skills creating a wide range of displays suitable for all occasions. Classes are designed around you and all refreshments and materials are included. Come on your own or with a group (5 maximum). Contact me today, read more. As an independent florist, I design especially for you, using both your ideas and mine but without the restraints imposed by a retail outlet. I buy fresh flowers for each commission, using experience and passion to provide you with beautiful arrangements that convey emotion and meaning. For that extra touch of luxury, I personally wrap my arrangements using complimentary materials and colours.